Chocolate pudding blended with whipped topping, graham crackers, mini marshmallows and nuts is frozen in paper muffin cups for frosty dessert treats. Pour milk into medium bowl. Add dry pudding mix. Beat with wire whisk 2 min.or until well blended. Add whipped topping, graham pieces, marshmallows and peanuts; mix lightly. 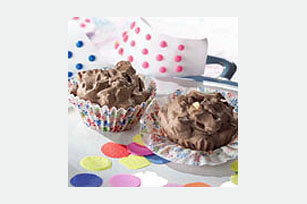 Spoon evenly into 8 paper-lined medium muffin cups or 8 (4-oz.) paper souffle cups. Freeze 3 hours or until firm. Store leftover desserts in freezer. Substitute 1 cup prepared DREAM WHIP Whipped Topping for the COOL WHIP Whipped Topping.